A new video project by Canada-based filmmaker Orazio Caltagirone, AIDSphobia, is now available to watch on YouTube. 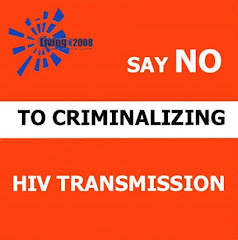 Mixing speeches by Edwin Cameron with TV footage and other existing media, the video explores various issues surrounding the criminalisation of people living with HIV. Although it can be confusing and difficult to watch at times, it is obvious that the filmmaker is passionate about the subject, and angry. "One of the main reasons why I decided to make this video is because this situation is getting out of control in my country," Orazio tells me in an email. The video totals 60 minutes, but is split into ten parts.